We’re into the Sweet 16 and the Elite Eight in the NCAA tournament, and PSSI Global Services is well-represented across the country. Dennis Smith and the NT21 truck are at Capital One Arena in Washington, DC for more wall-to-wall transmission services, including press conferences and backup game feeds. Ron Ford has much the same routine at the Sprint Center in Kansas City, MO. 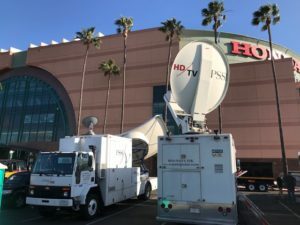 We have a dual threat at the Honda Center in Anaheim, CA, where Chris Hovden and Wes Hill are providing Ku and C-band transmissions for CBS. Kudos to both guys for responding quickly to a major power outage at the venue before the Michigan vs. Texas Tech game on Thursday night. In a split second both Chris and Wes switched over to their truck’s generator to minimize any losses. It’s just one example of our engineers’ quick thinking as well as the well-maintained, redundant systems on all of our trucks. Failures don’t happen often, but when they do, we are always prepared to respond immediately. We also have some NCAA Women’s tourney hoops on our schedule. Steve Hagerty’s providing ESPN with a multiplexed transmission of multiple women’s games this weekend from the Times Union Center in Albany, NY. And what about the NCAA hockey tourney? Mati Kerpen and the NT22 will be at the Dunkin’ Donuts Center in Providence, RI this weekend for NCAA Ice Hockey East Regionals, the last stop before the Frozen Four. Rick Kolinek is also squeezing in a hockey game before he heads to Minneapolis for the Final Four next week. He’ll have K22 at the BMO Harris Bank Center in Rockford, IL for Sunday’s game between the Chicago Wolves and the Rockford Ice Hogs. Another weekend chock full of Alliance of American Football (AAF) action. We’re at all four locations again this weekend, along with a lot of traffic in and out of PSSI International Teleport and our usual contingent at Sneaky Big Studios in Scottsdale, AZ. Let’s start in Scottsdale, where John Bright is back at the helm of the K34 truck. John will be the EIC for the remote productions of all the pre-game and halftime shows at Sneaky Big’s virtual set. He will also uplink backup feeds for a few games out of the K34’s antenna to Turner and NFL Network. Mark Huss is back in the racks at Sneaky Big, where he will decode and hand off the at-home transmissions from remote trucks in San Antonio and Memphis to the production crew inside Sneaky Big. PIT is the linchpin here, as they will ingest these remote feeds and send them down AT&T’s GVS fiber network to Arizona. The show is produced there, then sent back across the fiber network for redistribution by the networks and also for return feeds to the remote locations via PIT. It’s a complex setup, but now that we’re in Week 8 of AAF action, it has become a well-oiled machine. And of course it all starts with our team in the field. Gary O’Donovan and the C24 truck will be at Legion Field in Birmingham, AL, where the Atlanta Legends take on the Birmingham Iron on Sunday. Rick Ball and the C41 truck are back at the Liberty Bowl Stadium in Memphis, TN on Saturday when the Orlando Apollos take on the Memphis Express. Rick’s transmitting an at-home transmission yet again. 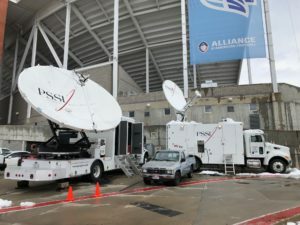 We have a two-truck solution in Salt Lake City, where David Meyer with the Midwest truck and Todd Harvey with the C49 are all set up at Rice Eccles Stadium for Saturday’s game between the the San Diego Fleet and the Salt Lake City Stallions. Steve Chaisson and the Frontline truck will be at the Alamodome on Sunday when the Arizona Hotshots take on the San Antonio Commanders. Steve has an at-home transmission, as well, and he will do much the same thing next weekend when the Commanders host the Memphis Express. These eight AAF teams are all in the hunt for a shot at the championship in just a few weeks, and we’ll be there for the rest of the season, including the playoffs and the final game in Dallas on April 27. We also had a little NFL football earlier in the week. Senior engineer Tracy Michaels was down at the Arizona Biltmore in Phoenix providing extensive production and transmission services at the annual NFL Owners’ Meetings. Tracy had quite a few signals coming in and out of the Atlas truck, as you can see! We also have a few big time fights this weekend. Nick Ray and Dave Buckman will be at 2300 Arena in Philadelphia, PA on Saturday for Top Rank on ESPN boxing when Oleksandr “The Nail” Gvozdyk will defend his world title for the first time against Doudou Ngumbu. The co-main event will include welterweight contender Egidijus Kavaliauskas in a 10 round match-up with Ray Robinson. Nick’s there to provide ESPN with a multiplexed transmission for their various platforms, including ESPN+. Dave will be providing the origination path for the international distribution of the fight. Strategic Television project manager Victor Verno will be there with Dave to ensure a clean delivery to the PSSI International Teleport, who will, in turn distribute the fight to Latin America and other takers around the world. 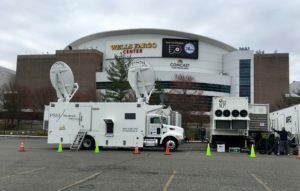 Just up the road, Mike Howley and Jim Flowers are in the CK25 mobile teleport at Wells Fargo Center in Philadelphia, PA, working alongside our friends at Concom to prepare for Saturday night’s UFC on ESPN event. The main event will feature Edson Barboza versus Justin Gaethje, and the co-main event has David Branch matched up against Jack Hermansson. Project manager Garrett Hunt is there to ensure the quality of both the domestic and international pathways, and will be working closely with the crew at PIT to make sure UFC fans around the world get all the MMA action they’re looking for. We are also the transmission provider of choice for DAZN, who has another fight this weekend in California. Brian Blomstrom and the Atlas truck will be at the Fantasy Springs Casino in Indio for Saturday’s bout between Angel Acosta and Ganigan Lopez. Also on the main fight card will be Ryan Garcia taking on Jose Lopez, Eduardo Hernandez battling Ibrahim Class, Joet Gonzalez versus Rodrigo Guerrero, and much more. Brian’s origination feed will be the source for DAZN subscribers around the world. Next week we’ll be getting ready for one of the biggest fighting events of the year: it’s Wrestlemania time! Tune in next week for the rundown of everything we’re doing for WWE this year. Buckle up! Two K&N Pro Series races this weekend, both of which will be taken down at the PSSI International Teleport and fibered over to our friends at NASCAR in Charlotte. Steve Toth and the K38 truck will be at South Boston Speedway in South Boston, VA for the NASCAR Whelen Modified Tour 150 and Late Model T-75. And Joe Cox is taking the LA Sprinter to Irwindale Speedway in Irwindale, CA on Saturday for the Night of Destruction and Napa Auto Parts 150. This is the last job for the Sprinter before we put the finishing touches on the truck for display at the 2019 NAB Show in Las Vegas. 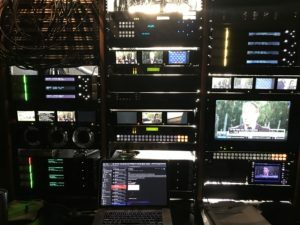 Our team in LA put on some new graphics touting our multiple IP capabilities, and also installed a Media Links shelf for access to the AT&T Global Video Services fiber network, and a Nextologies encoder for true IP distribution. 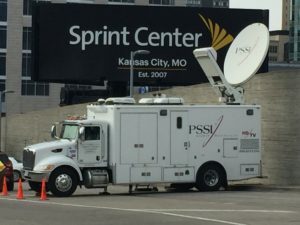 PSSI Global Services is comprised of the world’s transmission experts, and we can handle content distribution on any platform, from satellite to the public internet. Find out more about our ever-expanding capabilities at NAB, where we’ll be in booth SU5802. Still more racing! Dave Brin and the Starlight truck are at WeatherTech Raceway in Salinas, CA this weekend for the Intercontinental GT Challenge California 8 Hours. Ben Bradshaw and Kyle Meyer are in the C27 mobile teleport at Texas Motor Speedway in Justin, TX this week for NASCAR’s Monster Energy O’Reilly Auto Parts 500. As we do at every race, Ben and Kyle are providing data and video services via both fiber and satellite. We are also excited to announce that yet another truck has been outfitted with the equipment that enables us to be a mobile point-of-presence (POP) for AT&T GVS. Our Vegas team installed and tested a Media Links shelf in the C15 at the Las Vegas Motor Speedway this week. After a couple of tweaks we are all set for next weekend’s NHRA race, for which our truck will be the hub for multiple video and data services throughout the weekend. More to come next week! It’s a busy weekend for golf as we continue our almost year-round, exclusive transmission services with Golf Channel across the country and beyond. Mike Sheehan – who just happens to be our engineer of the quarter for Q1 2019 – is at the Austin Country Club in Austin, TX this week for the Dell Technologies Match Play event. Mike’s providing multi-path transmission and comms services for our friends at Golf Channel News. Benny Griffis and the C31 truck are at the Fallen Oak Golf Course in Saucier, MS for the Rapiscan Systems Classic this week. That truck will be the anchor of our multiple services at the Masters in August, GA, which, believe it or not, will begin next week. Larry Sheets and the C43 truck are at the Aviara Country Club at the Four Seasons in Carlsbad, CA this week for the KIA Classic. Last, but never least, Mike Lemieux is down at Corales Golf Course in Punta Cana, Dominican Republic for the Corales Punta Cana Championship. Mike’s working alongside our friends and partners at TV Cosmos to provide transmission services from this great tournament. Back here in LA, John Jennings is working yet another awards show! John and NT25 are at the Dolby Theater in Los Angeles this weekend for the landmark 50th annual NAACP Image Awards. Host Anthony Anderson will honor several African American leaders and artists, including Jay-Z, who will receive the President’s Award on Saturday night. Our News Group team is keeping busy, as well. Lorenzo Dottori and Scott Garber were in South Carolina for Cory Booker’s town hall speech, which aired live on multiple news networks, including CNN. Al Meshberg and Steve Mills will be heading to Minneapolis next week for news coverage surrounding the Final Four, and will be working alongside our Global Services engineers who are assigned to the game itself. Tune in next week for more details on what is sure to be another busy weekend!